"Flood Myths of the World: Riddles of the Past" by John Van Mater, Jr. Flood stories are found in every corner of the planet, and many riddles are connected with them. They often refer to giants or ancient humanities, divine incarnations -- even monsters, which point back to prehistory. * They embody actual geologic and historic events as well as describing the divine birth of universes and the pre-cosmic stirrings of worlds. Such "myths" can't be taken only literally, for their creators masterfully incorporated in them many levels of meaning: cosmic, astronomical, spiritual, psychological, scientific, historical, and ethical, among others. *Along these lines, Classical folklorist Adrienne Mayor, in The First Fossil Hunters (Princeton University Press, 2000), brings forward evidence that Greek stories involving giant bones are not mere fictions. She has found a very high correlation between current fossil sites of prehistoric animals and ancient descriptions of where bones of giants, heroes, and monsters were discovered, not only in Greece and Turkey, but in India, Spain, and France. The esoteric sciences describe an inner spiritual continuity of being, combined with catastrophism. H. P. Blavatsky's Secret Doctrine, which ties together many sources of ancient wisdom and history, refers to certain mythological sayings that "to the occultist . . . divulge two facts: (a) that the ancients knew as well, and better, perhaps, than the moderns do, astronomy, geognosy and cosmography in general; and (b) that the globe and its behavior have altered more than once since the primitive state of things" (2:534-5). Geognosy comes from the Greek Gaia, "earth," and gnosis, "knowing, knowledge"; it is that part of geology treating of the materials of the earth and its general exterior and interior constitutions. Gaia is the Greek goddess of earth as a living being, a term revived by scientist James Lovelock. Many deluges appear in traditions worldwide. The first is cosmic, the rest are terrestrial. The mother of all floods refers to the birth of the cosmos and the gods, to the waters of space which become the life- and death-giving waters of earth. Ancient spiritual traditions view all things -- atoms, planets, solar systems, and universes -- as living beings, divine in essence, the many sparks of one cosmic fire. Over immense periods of time there is a constant ebb and flow of the various waves of universal and planetary life, with karma as the divine harmony of the underlying absolute consciousness. Taking this and other more ancient stories, we can see that the ark or vessel floating on the abyss of waters often signifies the female generative power, carrying the germ of nature and mankind. Mystically the divine spirit of life, like Noah, emerges from chaos, a Greek term for this unfathomable, unknowable essence. In a Hindu allegory Vishnu in the form of a fish guides the ark of Vaivasvata Manu across the flood waters. Manu is accompanied by seven rishis or "sages," who may stand for man and the seven aspects of his being, the seven great human or terrestrial cycles, the seven planes of existence, as well as the seven solar gods. Xisuthrus, the Mesopotamian Noah, lands his boat on an Armenian mountain and is taken up alive into heaven to dwell with the gods. 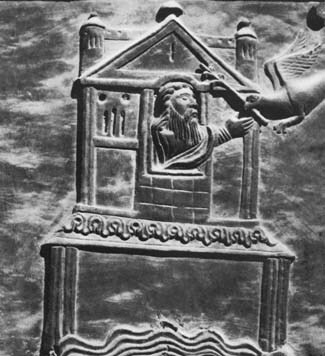 The Greek Deucalion is saved from the flood in a boat that lands on Mt. Parnassus, and with his wife repopulates the earth by throwing stones behind them. The Incas have their version of the flood, with a couple saved in a huge boat, and many other peoples of the Americas have their own deluge stories. In considering the figures in creation and flood myths, we must remember that they are part of a universal concept of builders and architects of worlds. We see this with the titans and kabiri of Greece and Asia Minor, the Hindu prajapatis, manus, and pitris, and the Hebrew elohim. They are the progenitors of both mankind and the lower kingdoms of nature, which they guide and protect from beginning to end of vast cycles. Their names are generic; for example, Noah may be identified with the kabiri or with spirit. Manu could represent a Prometheus or lightbringer, or an Atlantean giant -- the spiritual or physical titans who survived world deluges. What do these gods have to do with floods or other cataclysms affecting global changes of earth and her humanities? Divine consciousness is the impersonal karmic agency, of which the gods form a collective part. They are the informing wisdom in the solar system, the central heart and fount of life. The consciousness or "gods" behind what the ancients called the seven sacred planets transmit to earth the cosmic intelligences that shape the evolution and destiny of our planet and all on it. We can look at cycles in the highest cosmic sense as being the habits of the gods. They can be likened to our body's automatic physiology, but on a transcendentally higher level. These eternal cycles are tied to patterns of previous activity: nothing occurs by chance. Our humanity and the kingdoms of nature, even Gaia, are sustained and protected by the intelligent guidance of gods. The forces of consciousness behind evolution result in critical changes inwardly, various changes outwardly, some catastrophic. This process of natural imbalances set in motion by life, following the inherent cyclic rhythms of nature, means constant change. There are as many types of cycles connected with Gaia as there are with ourselves; and there is always a destructive aspect to regeneration as an essential part of creativity. The resulting changes occur within the larger harmonious operations of divine consciousness restoring balance. Awesome catastrophes of fire and water must have been impressed upon the human racial memory. These cataclysms were experienced and recorded by an intelligent humanity over many millions of years, for the antiquity of mankind is far greater than is now generally believed. Initiates are said to have kept records of time cycles marking the changes that took place in evolution throughout the existence of self-conscious mankind. The Hindus, Egyptians, Babylonians, Mayas, and many other peoples record numerous large and intricate time cycles which are often related to great changes in certain astronomical points, the polar motion of the earth, or to racial and cosmic time periods. The key figures in most cases, however, remain hidden. One large cycle found in these spiritual allegories involves great changes in the qualities and properties of matter. Our planet has periods of sleep or quietude between active periods. After the rest period there is a descending arc of spirit immersing itself in a flood of material forms. As theosophic tradition explains, the earth was first ethereal, astral, and gaseous before it became rocky and solid. At the densest midpoint of materiality a temporary equilibrium occurs, followed by an ascending arc of consciousness etherealizing matter. Plato described the last island of this system, Poseidonis, as sinking beyond the Pillars of Hercules (straits of Gibraltar) in ``a single day and night of misfortune'' about 11,000 years ago. This catastrophe may have been connected with the Atlantic Ocean entering the Mediterranean basin, which was dry at one time. There have also been many local floods -- the Gobi desert, western North America, part of Egypt, and the Sahara, too, have been shallow seas more than once. Theosophical literature states that we have passed the midpoint of our present great terrestrial cycle. In this context current global changes represent Gaia's karmic adjustments of renewal and balance. Beyond physical forces, the psychic-electromagnetic emanations of humanity and the rest of nature tend to build up cumulative effects which create stresses and imbalances that need release. The spiritual forces of Gaia respond on inner levels, resulting in huge elemental changes purifying the outer planet. What are these? We know of the explosive power of volcanoes and earthquakes, the forces of storms and winds, the great tidal waves and other floods, droughts, sudden freezing, the glacial action of ice ages, and so on. It is well known that some of the oldest lands are in the polar regions, which are occasionally inundated by oceans, then reemerge. In the north mammoths lived in the hundreds of thousands, then were mysteriously killed, stacked up in piles in some places, perhaps by a catastrophe or serious flood. Another strange occurrence, which science is aware of, is that the current polar regions have been frozen and then tropical more than once. Greenland was once lush with subtropical trees like the magnolia, and in northern Canada a swampland buried 30 million years ago was recently discovered, resembling the Everglades in Florida and similar swamps in ancient China. 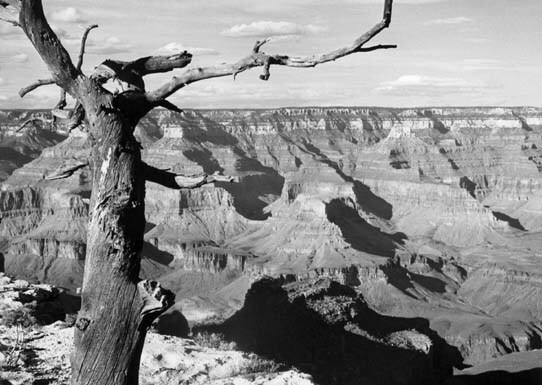 Geologists note that the Grand Canyon's deposition layers of limestone, sandstone, and other material show that at least seven ancient seas successively inundated the area before its uplift by the Pacific plate millions of years ago. Since mankind's appearance, the main cause of such changes may be a shift of the polar axis. Perhaps this is what caused Noah to cry out, "The earth labours, and is violently shaken; surely, I shall perish with it" and Enoch to speak of the great inclination of the earth (SD 2:145, 534; cf. Book of Enoch, ch. 64). An ancient commentary translated in The Secret Doctrine, referring to the midpoint of Lemuria, says the spin axis of the earth tilted, the sun and moon shone no longer over the heads of that portion of the Lemurians. People knew snow, ice, and frost, and men, plants, and animals were dwarfed in their growth. Those that did not perish remained as half-grown babes in size and intellect. The Lemurian giants thus became dwarfed at the poles due to rapid climatic changes. Ice ages have occurred at cyclic intervals into the far past, and there was melting or freezing of the polar ice which could account for some flooding or rising of lower land. But polar and axial shifts are only one factor -- there are many mysteries here. The Brazilian Indians and the Hopi of North America also refer to these destructions, the latter speaking of the earth wobbling in all directions before regular movements are reestablished and it orbits in its precessional cycles. The rhythm of the seasons and the number of days of the year depend on the tilt of the axis, the rate of rotation, and the earth's orbit. These may be like the regular beating of the heart, but they have subtle variations too, leading to extreme fluctuations at certain appointed periods. At such times, the ancient records say, the ends of the earth get loose and the earth tilts and wobbles. Science has not yet arrived at an understanding of these events depicted in myth. Because our present scientific knowledge is so incomplete, it is difficult for us to interpret the remains of the past. We are faced with riddles on every hand, but by studying the mythic, religious, symbolic, and physical evidence that has come down to us, we can begin to piece together a coherent answer to the questions posed by the flood stories so universal throughout mankind. The more our knowledge expands and the more respect we have for our ancient sources, the more light will shine on these riddles of the past.